The 5th Annual JerkFest is happening in one month on Saturday, June 24, 2017 from 11-8pm at the Benjamin Franklin Institute of Technology in Boston. 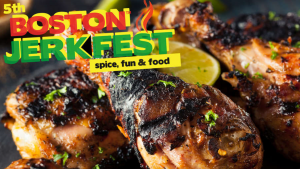 Enjoy samples of spicy foods, live entertainment, chef demos, and much more! General admission tickets are $20 on Saturday and kids ages 5-12 are $5. However, you can find free and discount tickets through Goldstar Boston to help save on tickets! There is also a Rum & Brew Tasting at Boston JerkFest the day before on Friday, June 23, 2017 with tickets from $50-$100. However, Goldstar Boston has discount tickets starting at $30 + service fees so you don’t have to pay full-price for tickets. Keep in mind the Friday night event is 21+ as it includes unlimited tastings of rum, craft beer, and more. Discount tickets are also available through Groupon with tickets available for $12 on Saturday and $39 on Friday. For more information about JerkFest, please head here. For more information or to buy tickets through Goldstar, please head here.